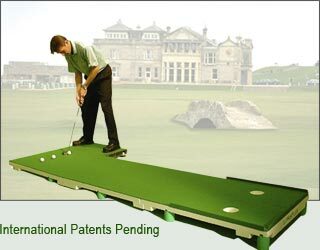 PuttingZone is now affiliated with Golf Around the World for training aids. Click the logo above to visit this site. All PuttingZone visitors using this link receive a 10% discount at GATW! PuttingZone visitors on this site. Mention the PZ when ordering. PuttingZone visitors get an exclusive whopping discount by special arrangement with Argon Laser! 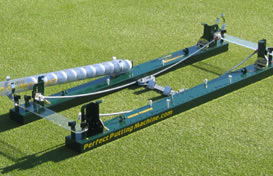 10% Discount using Coupon Code "Putting Zone" for the Perfect Pendulum training rod attachment for top of handle that converts your conventional putter to a belly putter for learning a no-hands stroke -- just $35.95 with PZ discount. Face squaring, solid impact, start line commitment, stroke path, ball goes where face aims ... comes with laser attachment to show where pointer is aimed (indoors). 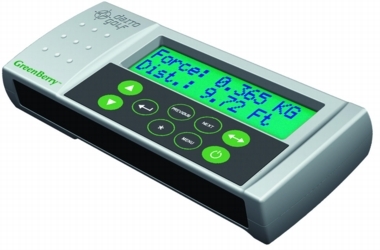 Electronic Stimpmeter for calibrating your stroke to green speed. The Putting Stick from Vlad Gribovsky's TPK Inc.
A comprehensive guide to putting technique by the European master instructor Harold Swash, with dozens of videos of the top putters on the European PGA Tour. Dr Karl Morris' putting psychology training using NLP and other advanced techniques, used by many top European players. "Practising with Trueplane has improved my putting technique and confidence". -- Trevor Immelman (7 wins since starting to use Trueplane including 2008 Masters) -- Visit Dr Roger Brooks' TruePlane Trainer. Sight Right a sight that fits on top of putter handle to show putter aim, especially useful for 10-15 footers. Birdie 007 laser aiming putter from Norway. 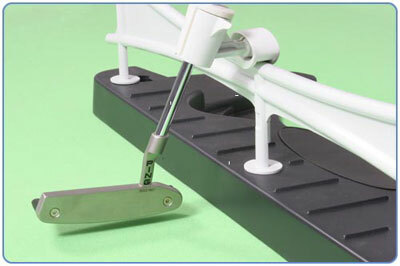 2-Way Putter Alignment System attachment to putter head aligning two white disks above ball on line. Photon Putter Laser attaches to shaft near putter head to show aim. 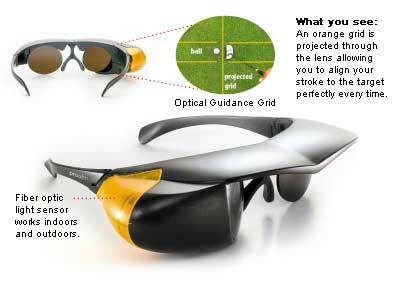 Golf IQ S-Factor stroke plane. Golf IQ S-Factor Putt Pocket hole reducer / gate. 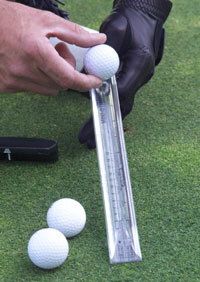 Golf IQ S-Factor Spot Liner ball marking tool. Golf IQ S-Factor Course Logix statistical program for putting stats. Sports Coach Putting Software part of the $20,000 system. 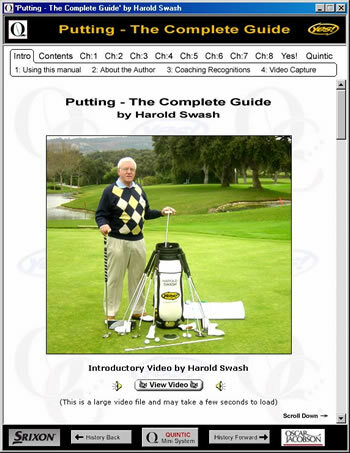 Probable Golf Instruction Putting Analysis Software for tracking putting stats ($9.99). TOMI System not ready for prime time -- plaugued by bugs that need fixin' before shippin'. Golf IQ Stroke Trainer ($40) -- a stroke plane set to 19 degrees (standard lie angle) at a good price with adjustments to grove your tempo -- good innovation. 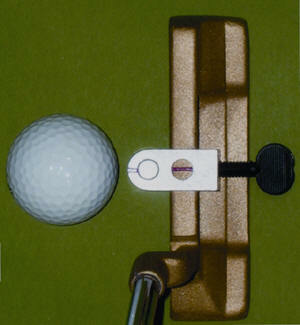 Rex Elmore's Trigger Golf "muscle memory" band ($30) -- a resistance-training exercise band to anchor in the green / ground and clip to the balance point of the putter shaft, whose use by stretching and holding in the finish position of a straight stroke creates a wonderful "afterimage" sensation of a good stroke -- simple and cheap, too! Aldo Enrique's BreakBuster Golf Balls (sleeve of 3 free with S&H of $8.99) -- a central black aim line on the ball with two other lines in color on either side that aim in angles off straight, with a procedure for aiming that selects one of the colored lines for the stroke in relation to the slope of the break. Neat, helpful idea. 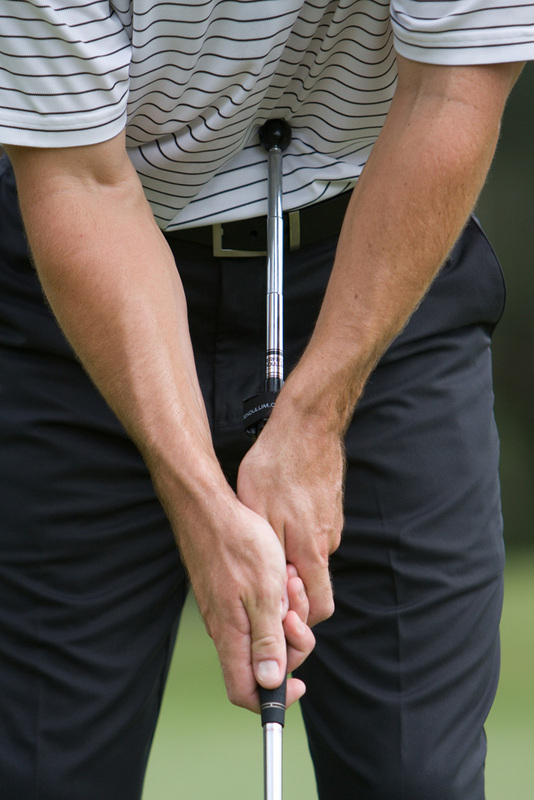 Jim Jamison: "As a tour player the two most important aspects for putting are line and feel for distance. 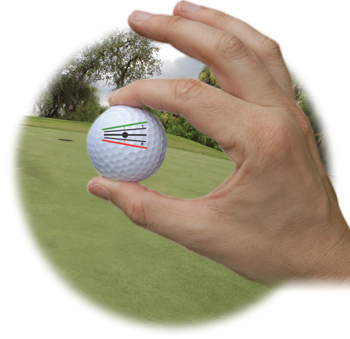 The BreakBruster helps the golfer find the line on breaking putts." 3L Putt's Argon Laser Putter (about $150) -- a self-contained red-light laser with three beams, from putter face, one either side of the ball and one over top of ball, all projecting lines along the ground and activated by buttons embedded in the handle, for learning how to aim the putter where intended and therefore to also learn how to putt straight where the putter aims -- comes with a practice target for indoor work. iClub Putting System software ($300) -- just another "technologist's" offering masquerading as teaching and causing golfers to chase parameters in a slice-and-dice approach. Useful for watching square impact, but so is the baseboard of a wall, a ruler, a string line or a chalk line or a line on the floor -- from a nongolfer graduate student at MIT. Esoteric Golf Technology's Path Finder ($119) -- a metal putting deck with moveable magnetic pegs on either side of the stroke path in backstroke, impact area and thru-stroke to allow golfer to first find and then practice his particular stroke path, so he can always keep putter face square to the path -- a popular, less-expensive articulation of the professional-grade PuttingGuide ($1,650+) that performs function more elaborately and precisely, with Annika Sorenstam's coach Henri Reis, the dean of Swedish coaches. 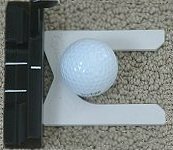 Puttline ($20) -- a rounded attachment for the putter face that requires a square, centered stroke -- much cheaper than the Putterball sort of approach, very useful info about delivering the putter back to impact and how it feels -- real cheap and simple, but current version may not work with center-shafted putters (cure coming soon). 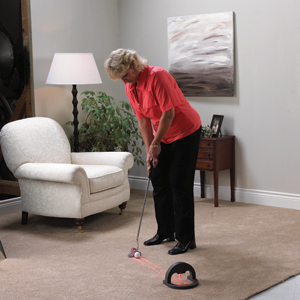 P3 Perfect Pendulum Putting aid ($90) -- magnetically attaching handles on frame on putter that separate the hands to different positions to train a non-hands, shoulder stroke -- interesting way to eliminate hand dominance and gain feel of good stroke in the upper torso area. RedEye Laser Putter ($180) -- laser in face that is registered by a target sensor for training dead aim, and putter converts to USGA-legal for play -- good combo. SuperStroke Putting Grip ($40) -- wide, oversized, squared, non-tapered grip similar in concept to Pure Pendulum, Two Thumbs, and Wishbone grips, which are cheaper. 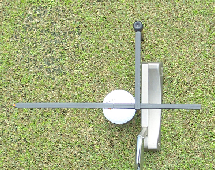 Puttalite training aid (no price info) -- dome that projects down to surface a circular light as virtual hole 4.25" wide that records and reports audibly whether putted ball crosses hole on line and with good speed, with software to store practice sessions and play games -- kind of depends on whether surface is good, mostly high-tech gimmickry.